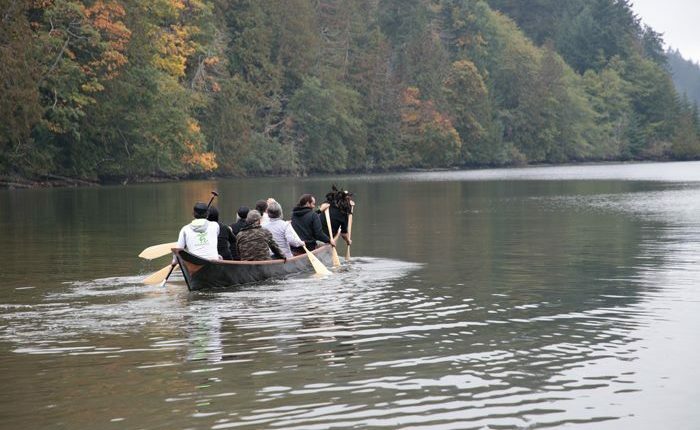 A cedar canoe is carried to the waters of Burgoyne Bay during the canoe’s inaugural launch. 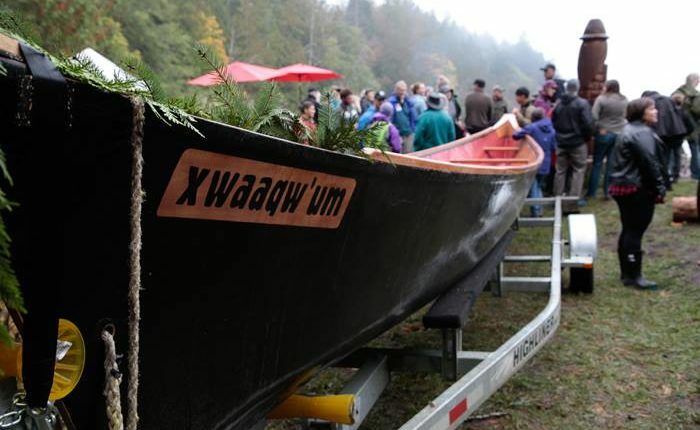 The Xwaaqw'um canoe ready for launch. 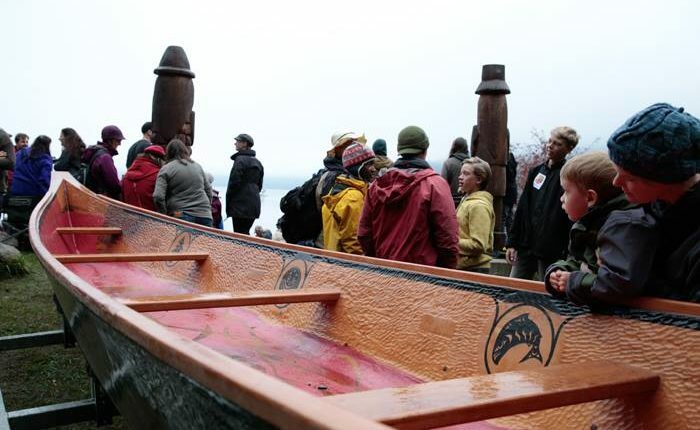 Visitors admire the canoe, carved from a single cedar trunk. 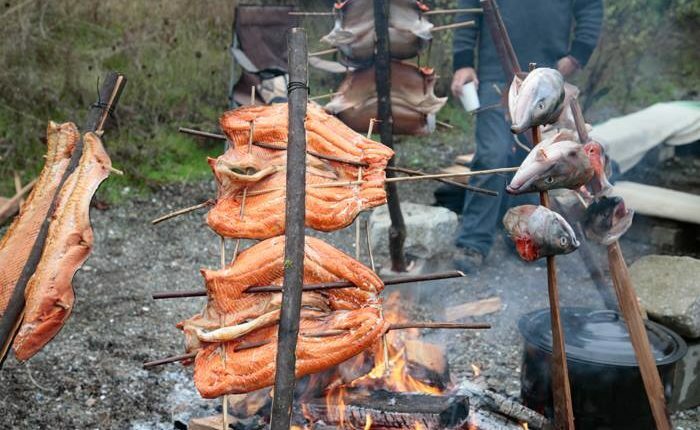 Salmon cooked traditionally over the fire. 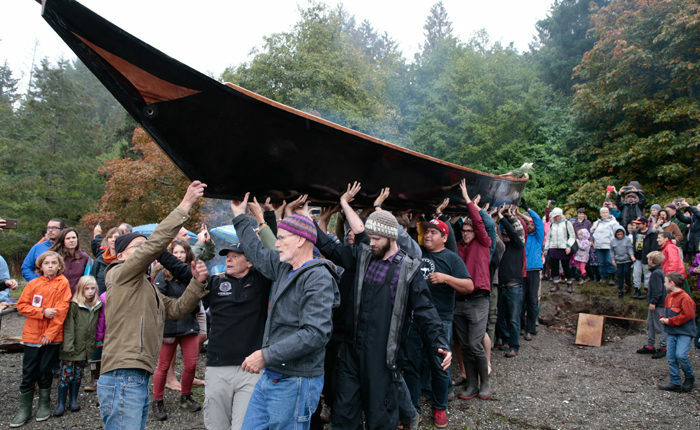 Luschiim and Joe Akerman present the canoe to Tousilum (right). 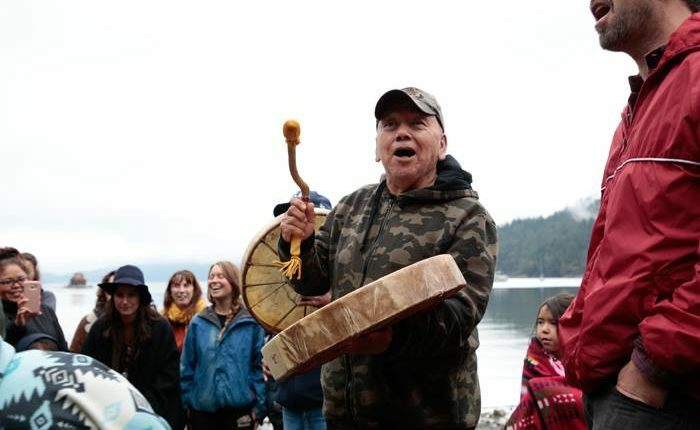 Qwiyahwul-t-hw, Jr. (Benny George), leads a traditional dance. Many hands carry the canoe to the water. Tousilum leads a song of thanks. 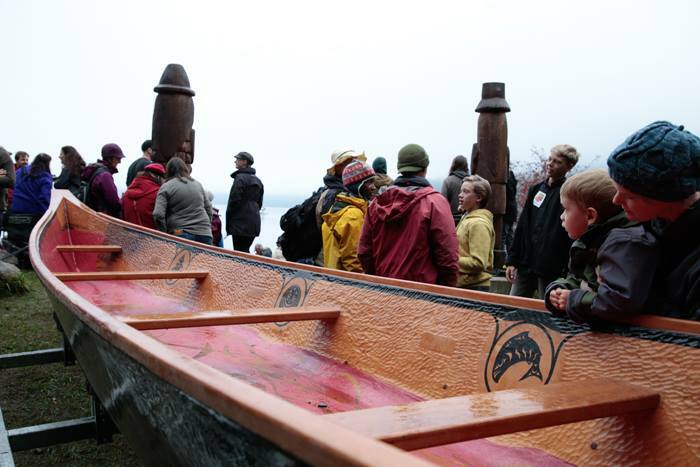 The event took place at 1 p.m. on Sunday at the Welcome Poles in Burgoyne Bay, also known as Xwaaqw’um. 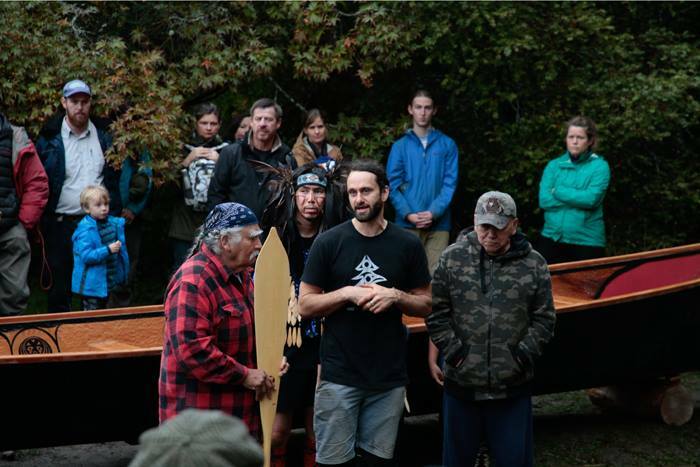 People gathered to help launch the canoe, which had been carved out of a single cedar tree over the last six months. 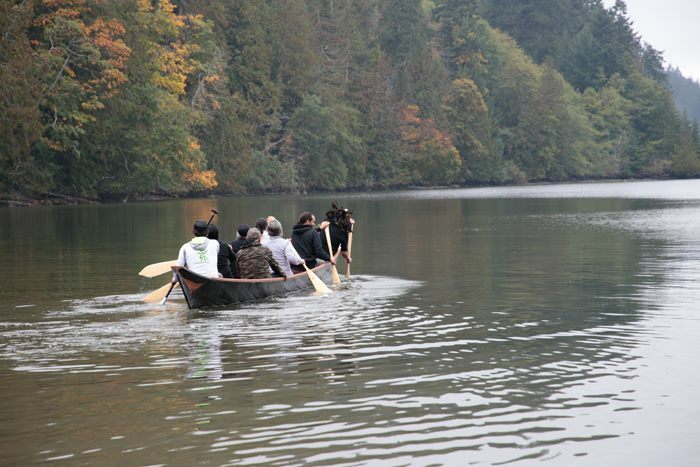 Work on the canoe began in April in Tla-o-qui-aht territory on Vancouver Island. After nearly six months of work and countless peoples’ efforts on the project, Snuhwulh was placed into the waters in the bay at high tide, borne on the shoulders of the community. 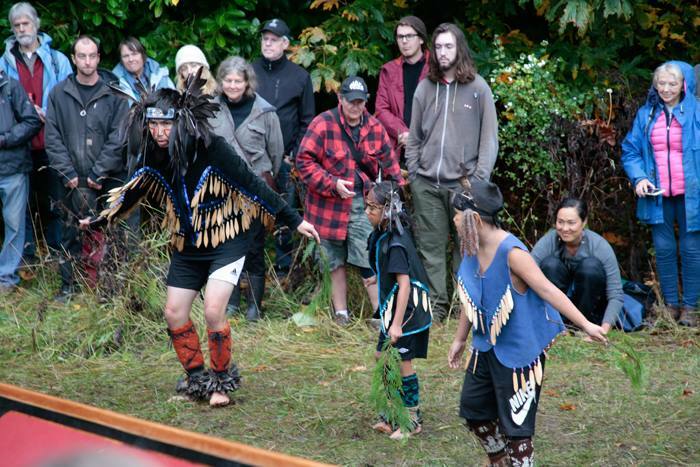 The event began with the elders blessing the canoe, and with Quw’utsun Tzinquaw dancers performing. 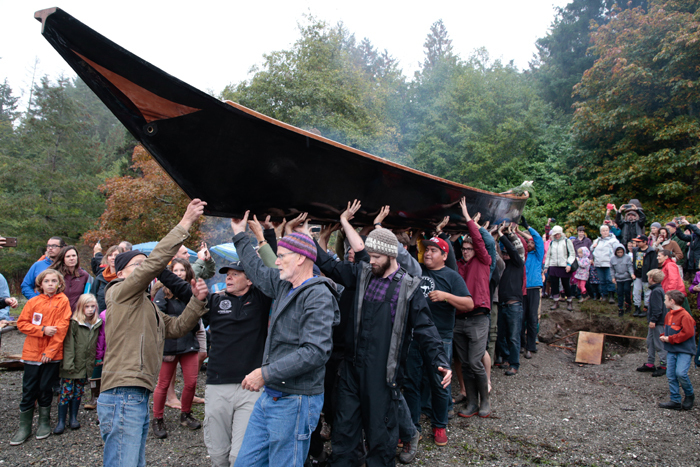 The canoe was then carried by the large group of people who had worked on it. The vessel’s maiden voyage was out into the calm waters of the bay, and was met with cheers from the crowd. 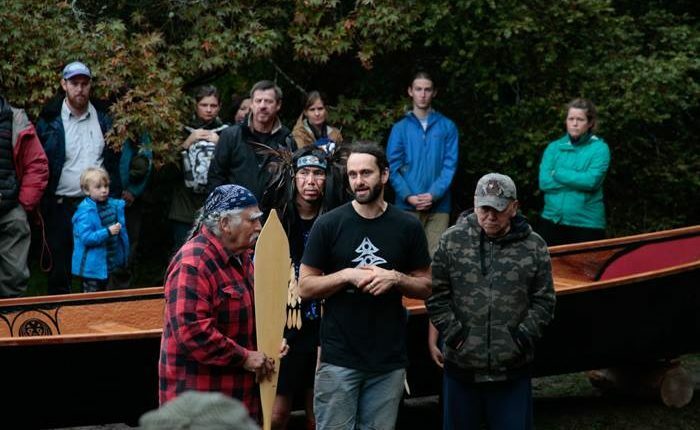 As part of the ceremony, one of the project leaders, Joe Akerman, gifted the canoe to Tousilum as a way of saying thanks for the elder’s contributions to the community. 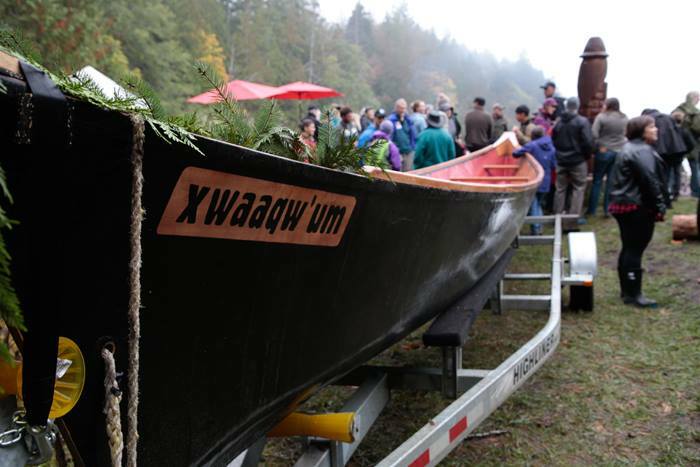 The canoe will be used by the community for tribal journeys, as well as for Indigenous youth camps, school groups and transportation to and from Salt Spring Island. 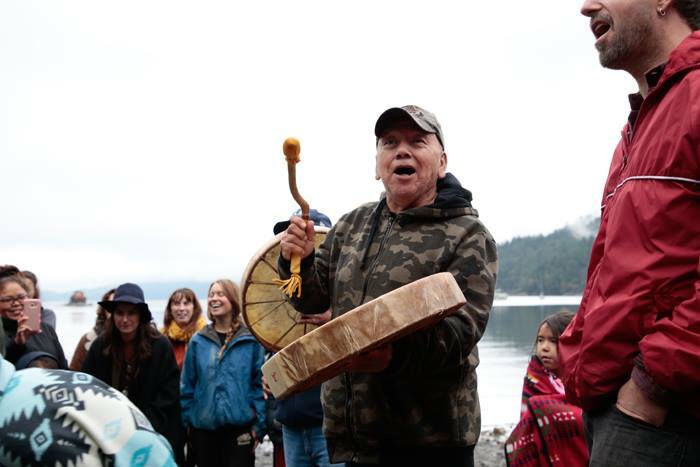 One of the main uses in the next year will be a long tribal journey from B.C. to California along the coast. “She’s a sea-going canoe. There’ll be waves as high as those trees,” he said. The canoe is 36 feet long. For longer voyages, the canoe will have room for nine paddlers, and removable seats can be added for school groups or smaller trips. 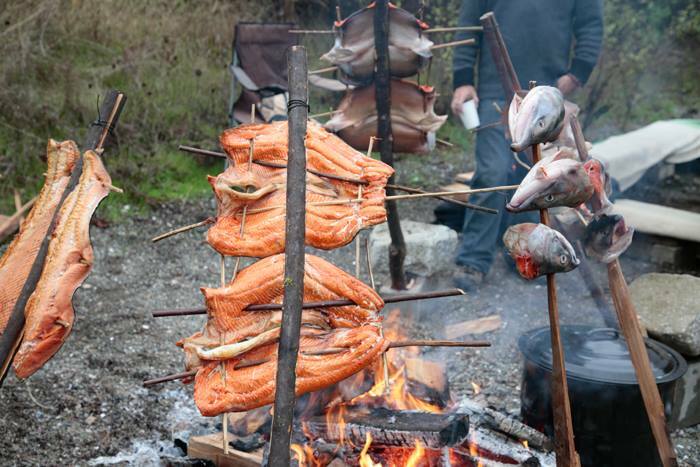 Xwaaqw’um is named after a Quw’utsun village that was made up of at least five longhouses in the Burgoyne Bay area. 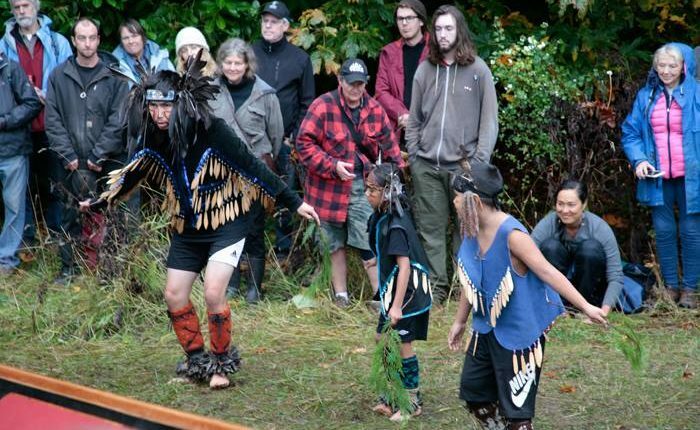 The group hosts youth camps and gatherings, teaches Indigenous knowledge and is helping to build relationships to benefit youth and future generations. 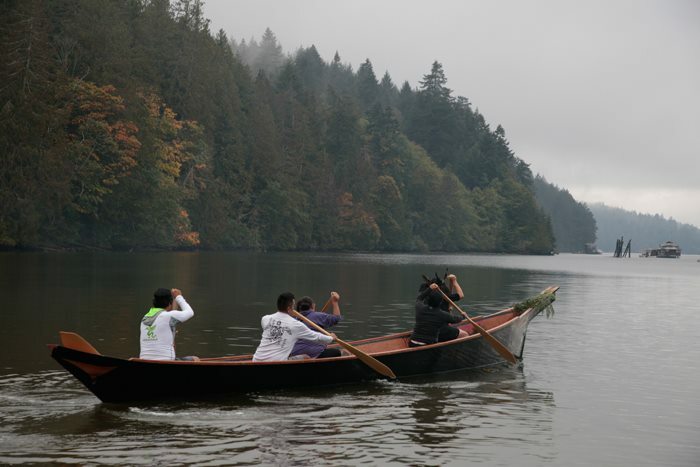 After leading the group in a song of thanks and opening the table for the potluck salmon lunch, Tousilum waded into the water with the help of Akerman to take his first trip in the canoe. 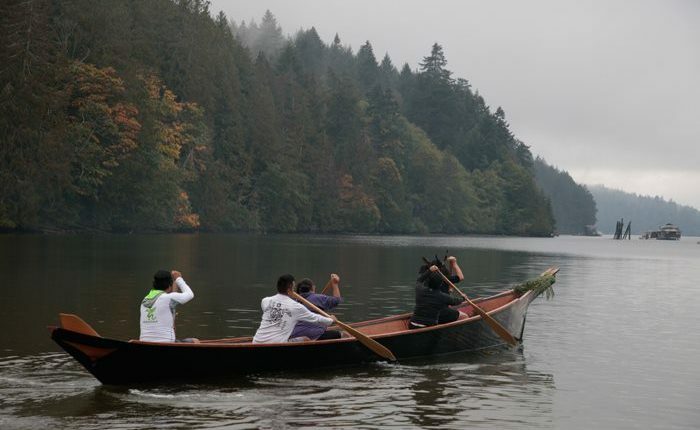 With Touslium’s son Qwiyahwul-t-hw, Jr. (Benny George) at the helm and other members of the community on board, the canoe glided out into the bay through the mist.